Carl Jung saw the sea as “the favorite symbol of the unconscious.” It may be appropriate then that Glenn Shean’s conscious decision to pursue a career in psychology would stem from him reading Jung during late-night lifeguarding shifts on a breakwater in the Gulf of Mexico. Shean had dabbled in engineering and business, but it was reading Jung as he listened for distressed swimmers in the dark that helped spark Shean’s interest in psychology. That interest led to a career spanning half a century in which Shean would focus on helping people faced with a different kind of distress: schizophrenia. As a graduate student at the University of Arizona, Shean didn’t have a particular interest in schizophrenia, but that began to change when he worked during the years 1965-66 as an intern for Veterans Affairs (VA) in Palo Alto and Menlo Park, California, where he was able to learn about some of the behavioral-based programs that were used to treat schizophrenia. After graduating, Shean came to William & Mary in 1966 where his job was split between professorial duties in the psychology department and work in the Counseling Center, serving as director during the early 1970s. Not long after starting at William & Mary, he gave a talk at Eastern State Hospital – a state-run mental health care facility located in Williamsburg – about the behavioral programs that he had seen during his internships. The assistant director of Eastern State heard the talk and invited Shean to pilot some of the programs there. At the time, Eastern State had 500-600 patients, said Shean, some of whom had been in the hospital for 35-40 years. With the help of a nurse and the unit medical director, Shean established a “token economy,” a reinforcement program that he hoped would help transform a unit of about 100 patients, who had, until that point, only been treated with medication. The patients could earn tokens for doing things like participating in sewing, cooking and literacy classes. The tokens could then be exchanged for privacy or items such as candy or cigarettes. As the token economy began to yield results, the hospital’s vocational rehabilitation staff – which had consisted of just one person – was flooded with money from U.S. President Lyndon B. Johnson’s “Great Society” programs. Although that allowed the hospital to hire more vocational rehab staff, they “had no program for working with hospital inpatients to help them transition to the community,” said Shean. And so, the W&M professor introduced another program that he had been involved with running at the VA Hospital in Menlo Park, California. Some of the participants received occupational training and, eventually, Shean and the hospital staff were able to form a non-profit corporation to pool resources and sign contracts in order to move one task group of the women comprised of 12 into a house on Richmond Road. The group secured contracts to work in hotels, laundries and restaurants, and the money they made was used to pay their rent and other expenses, with the remainder being split among the participants. The program, which lasted from about 1969 to 1984, was very successful, said Shean. Some of the women had been in Eastern State for decades, but, after participating in the program, none had to be re-hospitalized, he said. In fact, one woman who had been institutionalized for 35 consecutive years took a bus to Richmond one weekend and found a job and a place to live on her own after residing in the group home for about two years. “It made me so proud to see some of the really positive changes I saw,” said Shean. Through his work at Eastern State, Shean and his W&M graduate students were able to conduct research on schizophrenia by getting to spend time with the patients, many of whom Shean remembers well. “One fellow, would always come back from the cafeteria with pieces of bread, and would walk around talking to himself and breaking the pieces of bread up in patterns,” Shean said. “I eventually decided to go over and talk with him, and he just started sharing his delusional world. I got to know a lot of patients like that who were very psychotic but, in many cases, very bright and well educated individuals, some with advanced degrees. 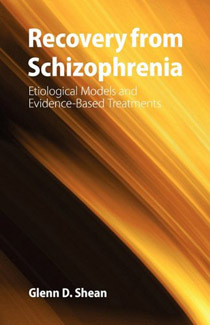 Shean has published four books on schizophrenia and more than 40 articles on the topic. He said that the freedom provided by 17 years of consulting and full-time summer work at Eastern State gave him a deep sense of appreciation for people diagnoses with schizophrenia and an awareness of the complexity and diversity of individuals diagnosed with this mental disorder. Shean’s work also led him to the conclusion that schizophrenia is not a single disorder. Unfortunately, the current mental health system does not provide many patients with that environment, said Shean. Instead, due in large part to a lack of funding, access to treatment is limited and the system relies heavily on medication instead of programs that provide graded opportunities for reassuming meaningful relationships and social roles. “It’s a tragedy that so many people don’t even have access to medication because Community Mental Health centers are so overwhelmed and underfunded that they are turning away new patients , and it’s also a tragedy that medication in most cases is the only treatment available,” he said. In addition to his work at Eastern State and research on schizophrenia, Shean has spent much of his career in service to William & Mary, working as a staff member and for a time as director of the Counseling Center for a few years before finally becoming a full-time psychology professor. After 49 years at the university, Shean is retiring at the end of the spring semester, and, along with taking art classes and spending time with his 4-year-old granddaughter, will find himself on the water again – but this time, reading James Joyce, Hemingway, Faulkner and Dostoyevsky on a sailboat, kayak or rocking chair instead of reading Jung while on a lifeguard stand. Despite the leisurely pursuits that await, Shean will miss William & Mary and the stimulation and opportunities for collaboration with students and colleagues it afforded him, including the many fascinating individuals he came to know and to converse with at Eastern State Hospital over an interval of more than 15 years. “I still remember so many people I met at Eastern State over the years so vividly,” he said. “It was a wonderful opportunity for me to observe, listen, learn and to conduct research. I didn’t have to treat anyone; I didn’t have to diagnose anyone – I simply consulted with the programs I helped develop and had the freedom to spend lots of summer afternoons simply sitting in the shade chatting with some very interesting characters, like a friend.